Mike Williamson turned down a summer move to Cardiff City because he felt he still had an important role to play at Newcastle United. And the defender believes he has done enough recently to continue his run in the side at White Hart Lane on Sunday. Williamson has been a reassuring presence during a seven-game stretch when Newcastle’s central defensive resources were stretched by absenteeism. And although Fabricio Coloccini is nearing a return from injury, Williamson has admitted he would be disappointed if he were the man to make way. “It is something for the manager to answer,” he said ahead of Sunday’s noon kick-off at Tottenham Hotspur. “Time will tell. All I can do if I get the chance is to go out and stay solid and try to keep more clean sheets. There is a quiet confidence about the 29-year-old which has served him well this year. 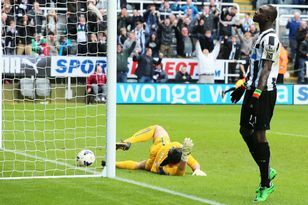 The January arrival of Mapou Yanga-Mbiwa pushed Willamson down to fourth in the pecking order for Newcastle centre-backs. He had the opportunity to join Cardiff in the summer but, with two years left on his contract, preferred to fight for his place. Yanga-Mbiwa showed his talent in subduing Fernando Torres and Samuel Eto’o at the weekend, but Williamson arguably outperformed him and is not prone to the same errors when up against a physical English-style centre-forward. More than that, though, Williamson just enjoys life in the North East. “I never wanted to leave,” he commented. “It is the biggest club I have been at. “I want to make as many appearances as I possibly can. You get to a certain age and you feel you want to play week-in, week-out. “I decided I wanted to play, and I would get that chance. I have had quite a few minutes recently and I’d love to continue. and there is competition in the squad and it has been difficult at times not playing. “But you have to back yourself and say when I do get my chance I will stake my claim. I have done well in the appearances I have made, and been unlucky with a couple of results, and I want to build on that now, especially the Chelsea game. “It is just waiting for the opportunity. When you don’t feel there is light at the end of the tunnel, and the team isn’t playing well, you feel you have a point to make to the manager that there is talent throughout the squad. “So yes, it is difficult but you have to keep the faith and keep believing. That is what the manager tried to instil in the squad as well. I had to believe my chance to start would come. “Whenever I cross paths with the manager I would speak to him and we have an understanding and hear his reasons. “When things are not going so well you have more of an opportunity. Meanwhile, Yohan Cabaye, Mathieu Debuchy, Moussa Sissoko and Loic Remy have been named in France’s squad for next week’s World Cup qualifying play-off against Ukraine. Les Bleus are in Kiev on Friday, with the return in Paris four days later. The winners of the two-legged tie will play in Brazil next summer. Nigeria, who host Ethiopia in the second leg of a play-off a week tomorrow, have named Shola Ameobi in their squad. The Super Eagles will be defending a 2-1 first-leg lead in Lagos. Papiss Cisse is in the Senegal party which will look to overturn a 3-1 deficit against the Ivory Coast (without the suspended Cheick Tiote) the same day.